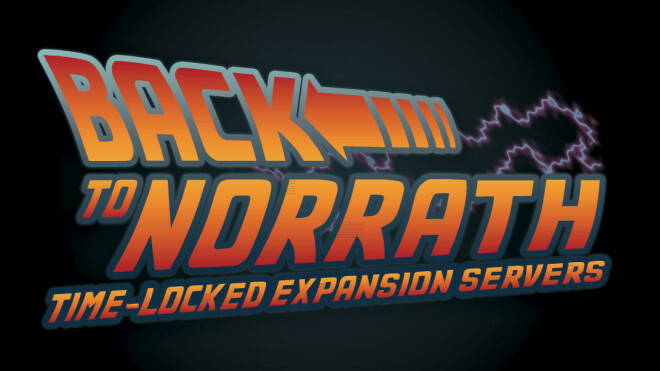 The Time-Locked Expansion Beta will be opening up soon is now open for ALL ACCESS members. Here are instructions on how to go ahead and be patched and ready to Beta test on the TLE (PvP) and TLE (PvE) Beta servers today. How Do I Get to Beta [TLDR] ? There is no Non-Disclosure Agreement to accept this year, and no separate Beta launcher to run. 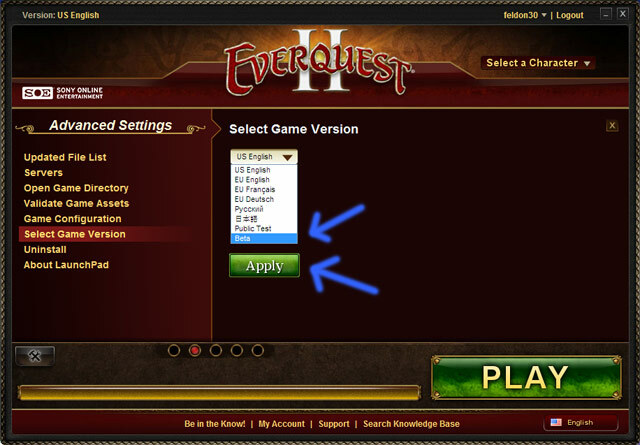 To access the Time-Locked Expansion Server beta, simply close and reopen your EverQuest II Launcher, click on the Version link in the top left corner (US English for US players), switch the region to “Beta“, click Apply, and let the patching begin! How Do I Get to Beta (step-by-step)? 1. Make sure EQ2 is not running. 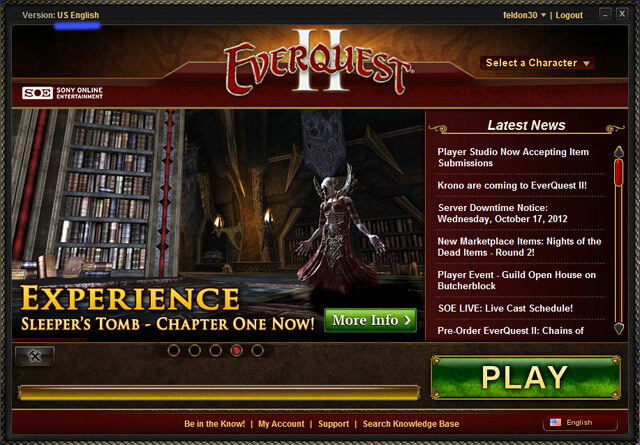 If your EverQuest II launcher is open, close and reopen it. 2. Click the Version link in the top left corner (US English for US players). 3. Change the Game Version to “Beta” and click “Apply“. FULL DOWNLOAD: Ctrl-click on your music and paks folders, and then press Ctrl-C. Click on your BetaServer folder and press Ctrl-V.
STREAMING: Click on your assetcache folder, and then press Ctrl-C. Now click on your BetaServer folder and press Ctrl-V. 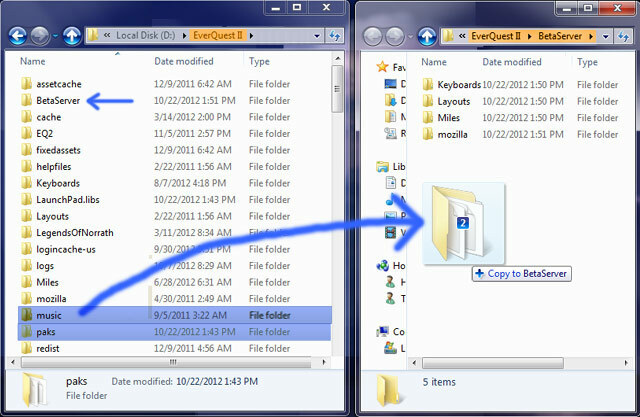 NOTE: You do not need to open the two windows side-by-side as I have done them above. I just did this for illustrative purposes. The Ctrl-C and Ctrl-V method described in step 4b is the easiest. 5. You may be asked if you want to overwrite any files. Choose “Replace” in this case. Once all the assets or paks/music are copied, you can now restart the Launcher and it will only take 15-30 minutes to patch the differences and let you start playing! 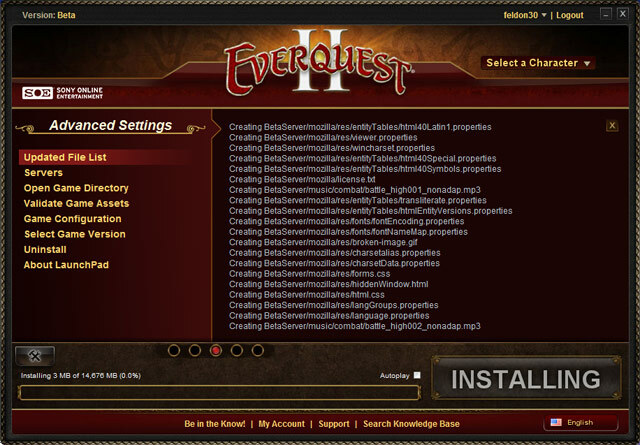 NOTE: If you have issues with crashes, delete your EverQuest II\Launchpad.libs file. Where’s the Beta Buffer? What about Beta Copies? There is not currently a beta buffer and it’s unclear if either beta buffers or beta copies will be allowed on these time-locked expansion servers. Will there be a Beta wipe? It seems only fair/reasonable that when the Beta servers are officially launched, they will be wiped and reset so that everyone is starting at the same level and degree of progress. Roshen and RadarX do not feel that separate forums for Time-Locked Expansions are necessary or appropriate. Thanks. FYI, your account name is visible to the world in your screen shots Feldon. Maybe a paintshop edit to protect yourself? I can’t log on Beta, always get Login issus ..
has anyone a black screen if it wants to log into the beta server ?? Same here have been trying since servers went up – just get a window that says Login not possible as client doesn’t match rerun the patcher. Even did the full download still the same. Has anyone been able to log into beta at all?